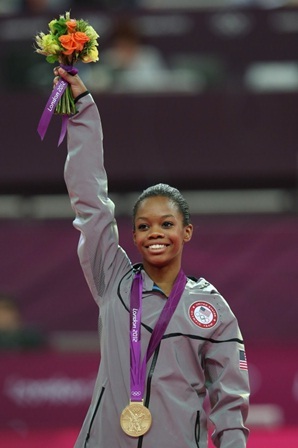 Poised and confident spitfire Gabrielle “Gabby” Douglas, “The Flying Squirrel,” won the women’s gymnastics individual all-around gold last night in London, making it a threepeat for the USA. Americans Nastia Liukin and Carly Patterson won in the 2008 and 2004 Games at Beijing and Athens, respectively. Mary Lou Retton, perhaps the US’s most famous female gymnast, is the fourth, and last, American woman to win the all-around gold. For most of the sport’s Olympic history, though, it has been the Romanians and Soviets who have dominated, at least in terms of overall medals. Here are all the Olympics medalists in the event since 1952, the first year it became official, followed by a breakdown by country. * Following the political collapse of the Soviet Union in 1991, Russia and 11 other former Communist block countries formed the Unified Team of 1992. The USA’s Women’s Gymnastics Team walked away with the gold medal in the team all-around event yesterday, the second in the country’s history and its first since 1996. 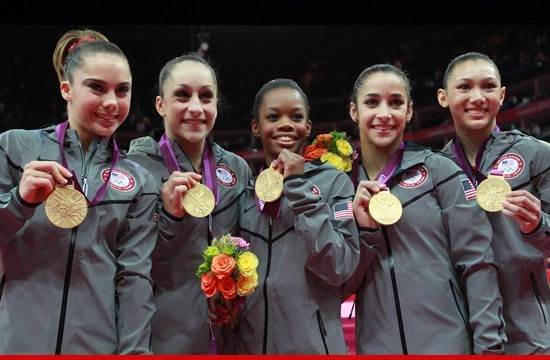 With so many competitive and well-known women gymnasts over the years – Mary Lou Retton, Shannon Miller, Kerri Strug, Carly Patterson and reigning individual gold medalist Nastia Liukin – one would think the Americans (in the team event) had won more gold. Nope. Just twice. Mary Lou Retton, perhaps the most famous American gymnast, scored big individually in 1984, but the team actually came in second. It doesn’t just happen to Americans. Nadia Comaneci, perhaps the most famous gymnast ever, went off with three golds and a perfect 10 in 1976, but Romania took the silver in the team all-around. Today’s list runs down those countries with the most women’s gymnastics team all-around medals in Olympics history, led by Comaneci’s Romania with 12. The Soviet Union has nine team medals – all gold – in second, followed by the USA with eight. Note, though, that if you combine the Soviet Union’s nine, with the Unified Team* gold in 1992 and Russia’s four team medals, then the Soviet Union and its political offspring have 14 medals all together. I’ve added a second list which ranks countries by the most gold medals, and finally a third list that provides the chronological order of all medal winners. Men’s gymnastics were a part of the Olympics since the first Games in 1896. Women’s gymnastics became an official event in 1928. Thanks to sports-reference.com, my source. Check it out!